Traction apophysitis has been described in tibial tuberosity (Osgood Schlatter's disease), calcaneus (Sever's disease), inferior pole of patella (Sinding Larsen-Johansen syndrome), and base of fifth metatarsal (Iselin's disease) (Ishii et al., 1994; Deniz et al., 2014). Traction apophysitis of accessory ossification center of the medial malleolus has also been described, which is rare (Ishii et al, 1994; Gupta et al, 2008; Klein et al, 2008; Farsetti et al., 2015). Traction apophysitis of both the accessory ossification center of medial malleoli is very rare. It typically presents with pain over tip of the medial malleolus at an age of 8-11 years, in individuals who are involved in sports. The pain gets aggravated on playing the sport and on forced valgus at ankle. The pain gets relieved by rest. On examination patients may present with Plano-valgus deformity of feet. Very few cases have been reported in previous studies, and none of them have been followed for one or more years to describe their eventual fate (Ishii et al, 1994; Gupta et al, 2008; Klein et al, 2008; Farsetti et al., 2015). Traction apophysitis of accessory ossification center of the medial malleolus may be misdiagnosed and maltreated as a malleolar fracture and ankle sprain. If untreated it may eventually cause irreversible changes in the distal tibial epiphysis. 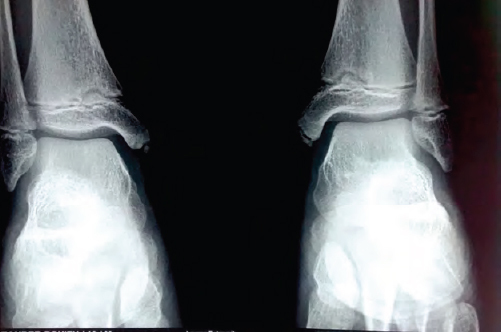 Here we reported findings of imaging, treatment and follow-up at the end of 1 year in an 11-year-old case with traction apophysitis of accessory ossification centers of both the medial malleoli. An 11-year-old boy presented with chief complaints of pain and swelling over the medial aspect of both the ankles since 1 month. The pain was aggravated when playing tennis and got relieved by rest. He was undergoing rigorous training for a forthcoming competitive tournament when the pain worsened. There was no significant past history. Palpation revealed tenderness over the tip of both medial malleoli anteriorly. He was also having correctable Plano valgus deformity of feet. Range of motion at the ankle and subtalar joints were within normal limits. Radiographs showed fragmented accessory ossification center of both medial malleoli [Figure 1]. MRI showed edema at the tip of the medial malleoli on T1- and T2-weighted sequences [Figure 2]. We treated him by medial arch support and discontinuation of sports for 6 weeks. We reviewed the case again after 6 weeks when his pain decreased considerably. He became asymptomatic at 8 weeks. We followed him at regular intervals for 1 year during which he remained asymptomatic. Follow-up at 1 year, X-rays showed fusion and healing of both the accessory ossification centers [Figure 3]. Differential diagnosis of traction apophysitis of accessory ossification center includes Os subtibiale and fracture of medial malleolus. Os subtibiale is a rare anomaly that results from the failure of fusion of an accessory ossicle to the posterior colliculus of the medial malleolus, which can be confused with a fracture as well as traction apophysitis of accessory ossification center of the medial malleolus. Tsuruta et al. (1981) in a study regarding 3,460 radiographs of patients over 7 years of age found the incidence of os subtibiale to be 0.9%. Coral (1987) in a study of 700 ankle radiographs could isolate only one case of os subtibiale. In the present case report, the accessory ossification centers on both sides fused after 1 year is a classical feature of an accessory ossification center at the tip of the medial malleolus. Traction apophysitis of accessory ossification center of the medial malleolus may be misdiagnosed and maltreated as a fracture of the medial malleolus. Careful interpretation of history, clinical examination, examination radiographs should help in distinguishing them. Ishii et al. (1994) first reported traction apophysitis of accessory ossification center of the medial malleolus amongst three children in a review of 134 young basketball players aged 8-11 years. They observed that there was a high incidence of tenderness along the tip of the medial malleolus in young basketball players and traction apophysitis of the accessory ossification centre is common in young children participating in vigorous sports. Their study also underlines that though traction apophysitis is common, it is the lack of recognition and rarity of cases described in the literature that the diagnosis is frequently missed. Our case became asymptomatic at the end of 8 weeks, and demonstrated healing on X-rays at 1 year. Treatment of traction apophysitis aimed at prevention of permanent damage to the ossification center by restricting sport activities (Ishii et al., 1994; Klein et al., 2008; Farsetti et al., 2015) or a below knee plaster of Paris slab (Gupta et al., 2008). We decided to treat our patient by giving a medial arch support for plano valgus deformity and restriction of sports for 6 weeks. The medial malleolus may have an accessory ossification center (Ishii et al., 1994). Accessory ossification centers have been reported in 1.6% to 47% of children between 6 to 11 years of age (Ishii et al., 1994). Bilateral accessory ossification centers have been reported in 13% of children in a study by Powell and Wycombe (1961). These centers fuse with distal tibial epiphysis after about 1 year (Ishii et al., 1994). These ossification centers are identified incidentally and rarely symptomatic (Gupta et al., 2008). Apophysitis of these accessory ossification centers has also been reported to occur due to acute eversion injury or chronic repetitive stresses (Farsetti et al., 2015). It is very difficult to say on the basis of available history and clinical examination, whether apophysitis preceded or succeeded the appearance of accessory ossification center of the medial malleolus, because instances of both have been reported in studies by Tajima (2015) and Powel (1961). There is some confusion in the terminology for traction apophysitis (Ishii et al., 1994; Gupta et al., 2008) and osteochondroses (Klein et al., 2008; Farsetti et al., 2015) of the accessory ossification center of the medial malleolus. Both have been used interchangeably. However, all the cases reported in the literature share common presentation and clinical features. All the cases reported were involved in some sports activity before appearance of symptoms and got relieved on discontinuation of sports. To the best of our knowledge, osteochondroses are a group of disorders with unknown cause (Canale, 2015). However, patients described in the literature became asymptomatic on discontinuation of sports and rest suggesting abnormal stresses as one of the causes. Our case also got relieved on discontinuation of sports. Hence, the term traction apophysitis would be appropriate for this entity. Wong and carter (1988) in experimental studies demonstrated acceleration of endochondral ossification on shear stresses and inhibition on tension. This study links appearance of accessory ossification centers in children involved in sports activities with repetitive shear stresses. We postulate that since the case presented here was involved in competitive sports in addition to having bilateral plano-valgus, his deltoid ligament on both sides were subjected to repetitive stresses. This resulted in fragmented appearance of accessory ossification centers on X-rays. MRI showed edema in the accessory ossification center. Canale ST (2015) Osteochondrosis or epiphysitis and other miscellaneous affections. In: Campbell's Operative Orthopedics. 12 th ed. (Canale ST, Beaty JH, eds), pp1113-1114. Philadelphia: Mosby. Coral A (1987) The radiology of skeletal elements in the subtibial region: incidence and significance. Skeletal Radiol 16:298-303. Deniz G, Kose O, Guneri B, Duygun F (2014) Traction apophysitis of the fifth metatarsal base in a child: Iselin's disease. BMJ Case Rep pii: bcr2014204687. Farsetti P, Dragoni M, Potenza V, Roberto C (2015) Osteochondrosis of the accessory ossification centre of the medial malleolus. J Pediatr Orthop B 24:28-30. Gupta R, Batra S, Verma A, Sharma VK, Grover SB (2008) Traction apophysitis of medial malleolus: a case report with review of the literature. Indian J Orthop 42:91-93. Ishii T, Miyagawa S, Hayashi K (1994) Traction apophysitis of the medial malleolus. J Bone Joint Surg Br 76:802-806. Klein R, Burgkart R, Woertler K, Gradinger R, Vogt S (2008) Osteochondrosis juvenilis of the medial malleolar epiphysis. J Bone Joint Surg Br 90:810-812. Powell HDW, Wycombe H (1961) Extra Centre of ossification for the medial malleolus in children: incidence and Significance. J Bone Joint Surg Br 43:107-113. Tsuruta T, Shiokawa Y, Kato A, Matsumoto T, Yamazoe Y, Oike T (1981) Radiological study of the accessory skeletal elements in the foot and ankle. Nippon Seikeigeka Gakkai Zasshi 55:357-370. Wong M, Carter DR (1988) Mechanical stress and morphogenetic endochondral ossification of the sternum. J Bone Joint Surg Am 70:992-1000.